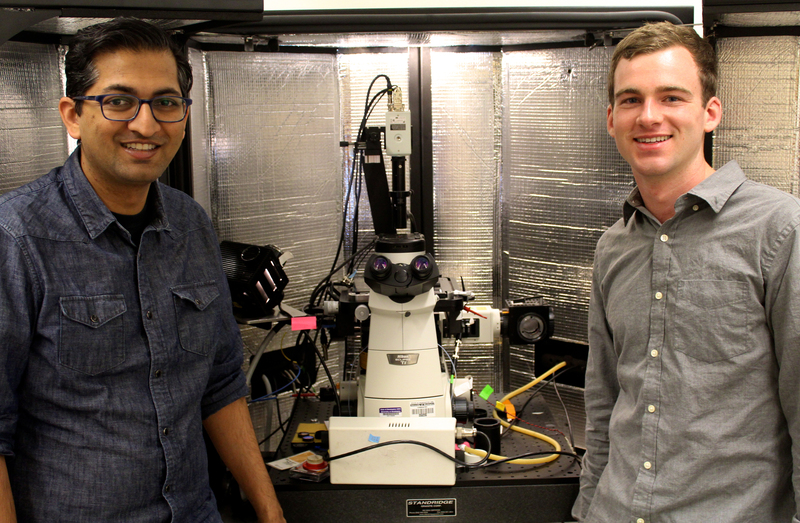 From the Ginger Lab: Lead author Rajiv Giridharagopal, left, and co-author Lucas Flagg, right, standing next to an atomic force microscope. Credit: Dane deQuilettes. David Ginger, CEI’s chief scientist, along with members of his research group, and students from professor Christine Luscombe’s lab, published a paper in Nature Materials this month that uncovers the design principles for making a conductive plastic polymer that can transport both ions and electrons more effectively. Organic semiconducting polymers are complex matrices made from repeating units of a carbon-rich molecule. An organic polymer that can accommodate both types of conduction — ions and electrons — is the key to creating new biosensors, flexible bioelectronic implants, and better batteries. But differences in size and behavior between tiny electrons and bulky ions have made this no easy task. Read more about this research in this UW press release. The full paper is available here.